Water temperature is dropping fast with cold nightime temps. McGee Bay has water down to 50 deg in the shallows and out to a beautiful 56-58 out in about 7-8 ft. The north end is getting back to reasonable temps along Green Banks as well. Kent is in SoCal doing fly club seminars but the word around the shop from other guides is that the lake is still producing fair numbers and some big fish daily. 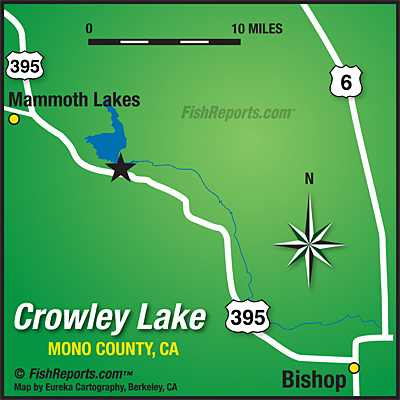 For McGee fishing goes from wide open to slow-steady day by day but overall the big attraction is the 20+ inch fish that are prevelent everyday, with most fish in that 15-16" range. Stay outside in about 7-10 ft of water where you'll find a mix of sizes and species. Crooked Creek has shut down due to algae and Green Banks has been pretty steady. There is a 50 ft wide stripe of cooler water leading from inside to outside and if you are off the stripe you will starve. Get in line with other boats who are catching. Location is very important these days. A four DVD copy of the recent Crowley University seminar will be available soon for those who could not attend. This is a reference library you need to ad to your arsenal if you fish the lake.